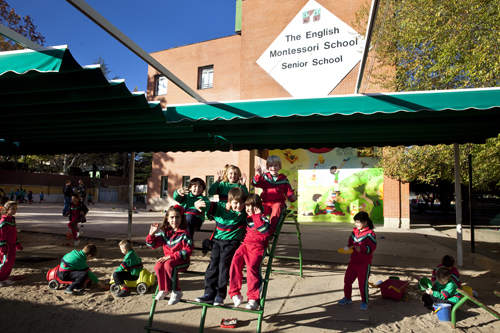 The English Montessori School (TEMS) is a private coeducational day school, located in Aravaca, one of the most attractive suburban area to the west of Madrid. The school was established in Spain in 1975 and is officially recognised by the Ministry of Education and Science as a British centre. The academic progress is validated at the equivalent levels in the Spanish educational system. The vital first years are spent in the warmth and protection of the full “Montessori environment” where the child acquires confidence, respect for others, self discipline, the skills of how to acquire knowledge and the self motivation for learning and growth. The school offers a dynamic and individualised education. All the classes include tasks which cover basic subjects as English Language, Mathematics, cultural themes, environmental studies, sensorial/motor studies and tasks related to everyday life. Facilities for the smallest children are warm and comfortable, offering them a homey atmosphere with all the elements required for their early education. As the child matures and moves up, the teaching pursues the objectives of the British National Curriculum, as well as those of the Montessori Philosophy. The subject areas include English Language, Mathematics and Science, Geography, History, French, Computers, Art, Music and Physical Education. Pupils also study Spanish Language and Social Studies in Spanish, achieving the same levels as in Spanish schools in these areas. Cambridge University I.G.C.S.E. 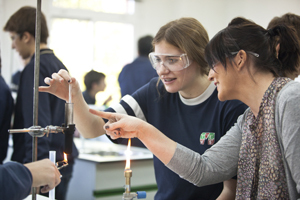 programmes are followed at the Senior levels, up to Year 11. Year 12 and 13 follow the Spanish Bachillerato programme and the Cambridge University Proficiency. Teaching at this stage is aimed at achieving the pupil’s physical and mental potential, in order to lay the foundation for his later development. Our teaching staff is composed of International and Spanish university graduates. In addition to encouraging academic achievement, teachers concentrate on their pupil’s well-being, training him or her to be able to reason and to take interest in research, following the principles of the Montessori philosophy. Within the curriculum there are regular cultural visits to museums, galleries, theatres, factories and other venues relevant to the current themes of study. 2-3 day camping and Farm Trips are organized, as well as a ski week. Extra classes, provided by external staff cover judo, ballet, catechism, fine arts, computers, athletics, and soccer. The school building is expressly designed for use in educational activities. The facilities include three laboratories, and computer room, art room, a library, music room, gymnasium, multi-purpose room and all-weather sports area. The English Montessori School is a member of the following associations: N.A.B.S.S. (National Association of British Schools in Spain) A.C.A.D.E. 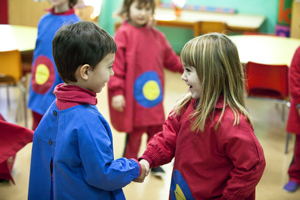 (Asociación de Centros Autónomos de Enseñanza en España) M.A.C.T.E (Montessori Accreditation Council for Teacher Education).